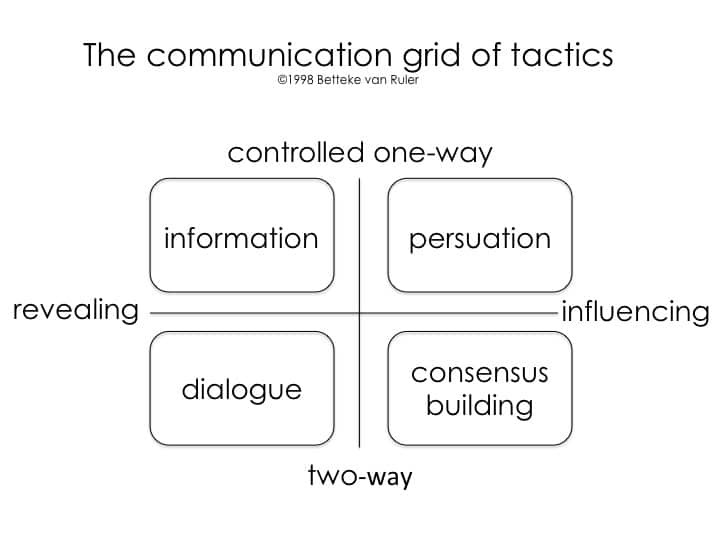 THE COMMUNICATION GRID OF TACTICS by Betteke van Ruler: an introduction of a model of four communication tactics. Increasing numbers of professionals in public relations consider themselves to be strategic managers and consultants. Surprisingly, they have difficulty in making clear what it really is that they manage and what their consultations truly represent, what aims they have and what strategies they use. The Communication Grid identifies four strategies of public relations practice: information, persuasion, consensus-building and dialogue. These four strategies constitute the tool-kit of public relations. Anyone who manages an organisation’s communications can use individual strategies to resolve specific communication problems. The model consists of basic communication strategies, derived from communication theory and rooted in described public relations approaches.